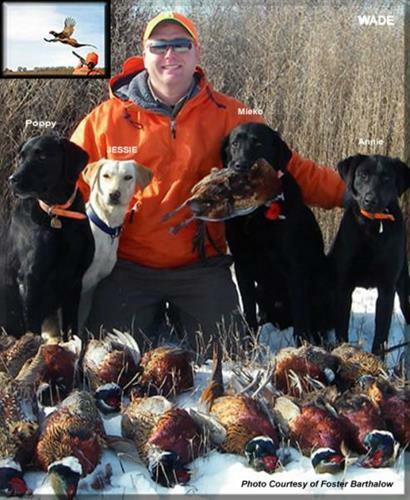 Be our guest and enjoy wild pheasant hunting on 4,000+ acres of prime family owned land in South Dakota behind the area's finest professionally trained and Field Champion Bred Labradors. Our land consists of corn, milo food plots, CRP grass, tree belts, sloughs and a water source that ensures a year around supply for the birds and other wildlife. In order to provide the best pheasant hunting in South Dakota and guarantee maximum bird populations, we have groomed each field for plenty of nesting habitat; food, water, and good shelter from the elements are provided to guarantee maximum bird populations.